[S2] GRO Indexes to Births. "1930/Q3 PASK, Stuart C. SAVAGE Leicester 7a 350." 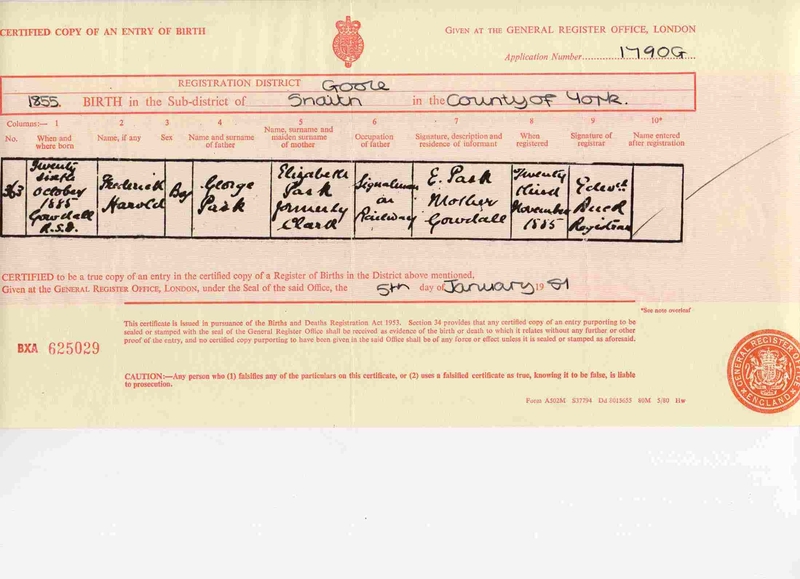 [S69] Copy of the birth certificate of Stuart Charles Pask, born 4 July 1930. [S3] GRO Indexes to Marriages. "1954/Q1 PASK, Stuart C. BEARDSLEY Ilkeston 3a 896." [S3] GRO Indexes to Marriages. "1977/Q1 PASK, Stuart C. = JONES, Teresa D. M. Plymouth 21 1127." [S70] Original marriage certificate of Stuart Charles Pask and Teresa Denise Margaret Jones formerly Euridge, 21 January 1977. Between 1899 and 1911, Frederick was an apprentice Fitter and Turner in the brass gallery at Richard Hornsby Sons Limited, Grantham continuing in their employment as a Journeyman until aged 25, then as a fully skilled tradesman. 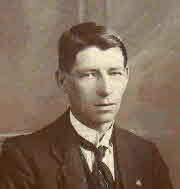 Just after the beginning of the war in 1914, he volunteered for service as a Naval Ordnance Artificer, and was based at Chatham, with attachments to dockyard installations at Rosyth, Dunkerque (for a short period), Invergordon, Thurso, and Scapa Flow. He found employment at Belvoir Castle repairing farm equipment and general handyman work - at times cleaning windows and acting as Grounds Security at the Society Balls in the Castle.12 In 1925 he found employment back in his trade in Leicester, on the manufacture of Woodworking Machinery, with Companies which included Mellor Bromleys, Stibbies, and Wadkin's, on the installation of their machines at their customers' factories. [S2] GRO Indexes to Births. "1885/Q4 PASK, Frederick Harold Goole 9c 780." [S3063] Copy of the birth certificate of Frederick Harold Pask, born 26 October 1885. [S4857] Copy of the marriage certificate of Frederick Harold Pask and Frances Alice Wright, 12 April 1908. [S3] GRO Indexes to Marriages. "1908/Q2 PASK, Frederick Harold = WRIGHT, Frances Alice Grantham 7a 1160." [S4] GRO Indexes to Deaths. "1919/Q1 PASK, Frances A. Grantham 7a 771 age 32." 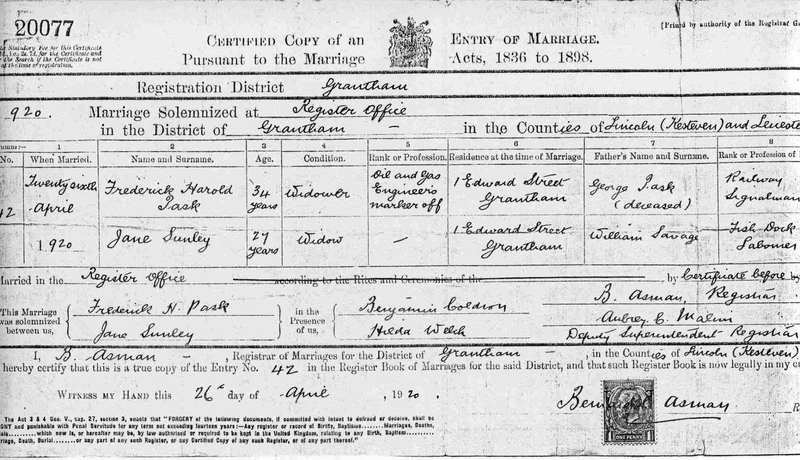 [S4858] Copy of the marriage certificate of Frederick Harold Pask and Jane Sunley, 26 April 1920. [S3] GRO Indexes to Marriages. "1920/Q2 PASK, Frederick G. = SUNLEY, Jane Grantham 7a 1611 (Incorrectly recorded as Frederick G; instead of Frederick H."
[S2] GRO Indexes to Births. "1951/Q2 SAVIN, Margaret E PASQUE Oxford." Research Note: For more information see Jane Savage in my maternal family. [S4] GRO Indexes to Deaths. "PASK, JANE 17 May 1892 BASFORD 1985 February Page No 17 Reg No 285." [S8] Website Commonwealth War Graves Commission (http://www.cwgc.org). 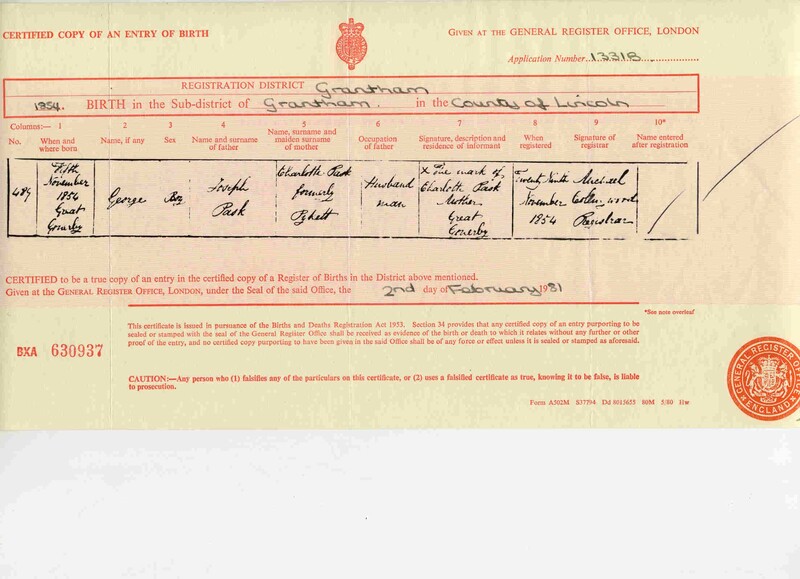 [S72] Copy of the death certificate of Jane Pask, who died 1 February 1985. For more than 60 years bandsman Fred Pask, 82, of Nuthall, played the biggest instrument in the band - the B-flat bass tuba. A stalwart, who remains on the band's reserve, he recalled many happy highlights, including tours to Switzerland and Norway, appearing at London's Royal Albert Hall, several radio broadcasts and taking part in the televised Songs of Praise. "His favourite anecdote came as the band lined up on either side of a pathway to play a royal farewell after the Queen and the Duke of Edinburgh opened a church project in Hyson Green. There was torrential rain and although I was half under a canopy, water dripped into my bass. Just before stepping into the car, Prince Philip leaned over to ask: 'Are you gurgling yet, tuba?12'"
How do you sum up the life of a beloved Parent who has lived a full life for 91 years? It’s not an easy task, but hard though it is I would like to honour my father by trying to do just that. My father was born Frederick Ernest Pask on 13th March 1923, at Woolsthorpe-by-Belvoir, Leicester, where he lived with his parents and their then four children - Harold, Evelyn, James, and Dad. Stuart, his youngest brother, was born seven years later. The family moved to Nottingham while Dad was still a schoolboy, and as he would tell you himself, he was not at all academic - in fact he heartily disliked school!! Dad came from a family of Engineers - his father was an Engineer, as were all his brothers, so no-one was surprised when Dad became an Engineer too. By 1941, everyone was involved in war work, so the whole family were directed to move on yet again to Newport, Monmouthshire. 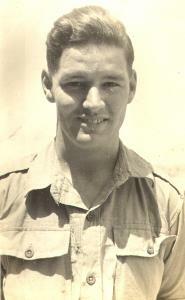 Dad had started his Trade Apprenticeship, which he continued at the Royal Ordnance Factory. At the end of which his Trade Apprenticeship Certificate confirms: "Character very Good, Ability Very Good, Timekeeping Good" followed by "This Apprentice did very well........and as a result was awarded a Merit Scholarship". Marriage to my mother Elsie followed, and early on in their marriage my parents were bereaved by the loss of their first child - their baby son Michael, who died by accident. Dad never forgot Michael, and he was remembered every birthday and Christmas for the rest of Dad's life. Later, I came along, followed soon afterwards by Dad being conscripted at the end of his Apprenticeship to join the Army, where he saw service in Ireland and Malta, achieving the rank of Sergeant. He was very proud of his own military service, so he was immensely proud when my son Stephen later chose a career in the Royal Navy. After being discharged from the Army, Dad resumed his career as an Engineer, commencing work with British Railways as a Fitter - an arduous and strenuous job working round the clock shifts in all weathers. It was here he developed his life-long love affair with Steam Trains. War work at an end, the family returned to their roots and moved back to Nottingham, Dad transferring his employment to British Railways Toton Depot. One of my earliest memories was Dad taking me to the Railway Depot on Friday afternoons after he'd worked on the night-shift all week - to collect his wages. To a small girl of three, this was such an exciting place to be, with giant Steam Engines making loud whistles and noises, and puffing clouds of smoke, and he carried me around the depot in his arms or on his shoulders because it was too dangerous to let me wander around. If I was a good girl he'd persuade one of his train-driver pals to let him take me onto the footplate for a ride (completely against all the rules of course!) showing me where they shovelled the coal into the fiery furnace, which got so hot the drivers could fry eggs on the shovel for their breakfast! He taught me the names of the engines - which were always known to be ladies and called ‘she’. To a small child, absolute magic. In those days, times were hard and money was short, so Dad worked all hours to make extra money for the family. But he was generous with what he had, and I well remember Dad giving me his last half-a-crown to send me on a school trip, which was meant to be his money for the week. What Dad loved to do above all else when he wasn't working hard was to go to his beloved Salvation Army. A passionate and enthusiastic Salvationist, we went along every Sunday. Dad played the Double Bass, and sang in the Songsters, and I of course went to Sunday School, joined the Singing Company, and played the tambourine. Always willing to serve, Dad was commissioned as Recruiting Sergeant in June 1961. Life changed significantly for my Father in 1965 when his marriage ended, and it changed again in March 1966, when Dad married Doris, who most of you will also have known very well indeed. Known to their numerous friends and Salvationists alike as "Doris and Fred" they both worked tirelessly for the Salvation Army for many years and had an enduring and very happy marriage for 36 years. Now there was time for family, holidays and enjoyment of their two Grandchildren, five Great-Grandchildren, and nieces and nephews. There were trips abroad with the Band, a visit to Oberammergau to see the famous Passion Play, and most memorably a visit to the Holy Land. My father's health was not without problems, and always having had severe arthritis accelerated by his strenuous job the arthritis took more and more of a hold, so major surgery was required. He was eventually forced to retire early in 1985 but Doris and Fred carried on their service to the Salvation Army devoting most of their spare time to its service. Altogether Dad served in the Band and Songsters for over 50 years, in addition to which he was also Recruiting Sergeant for many years whilst Doris served for many years as Home League Secretary. Dad and Doris loved entertaining, and were famous for cramming loads of people into their little bungalow, with Doris cooking up a storm, feeding delicious food to everyone. Christmases were particularly memorable - everyone was welcome. However, very sadly, Doris suddenly passed away most unexpectedly in April 1999, which really was a dreadful blow for Dad. 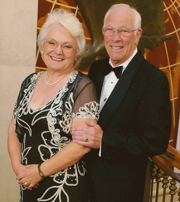 However, Dad was blessed to be part of a close community in Nuthall, where he and Doris had made many friends, and he also had close connections with his local Church in Nuthall. Eventually though, Dad moved from his bungalow into a Sheltered Housing flat in Basford for extra support. As his health problems mounted, and following many admissions to Hospital with falls and mini-strokes, Dad eventually decided he wanted to move down to sunny East Anglia in 2010, to be nearer to us, my family having lived here for some years a brave move I'm sure you will agree. But he embraced the change and eventually settled into the slower pace of life here in East Anglia, transferring to worship at Ipswich Citadel. Dad loved to socialise and looked forward so much to the Cameo Club lunches where, as is always the case with the Army, he was welcomed with open arms and made many friends. Ever an issue, his mobility continued to deteriorate and he became confined to his wheelchair. Numerous admissions to Ipswich Hospital forced Dad to reluctantly agree that on the advice of the Hospital he needed to accept professional full-time care. We were blessed to find a superb Residential Care Home, Maynell House, Felixstowe. Here he was cared for during the last 3 years of his life with the utmost patience kindness and consideration - for which my family and I will always be eternally grateful. The wonderful carers at Maynell House deserve the highest praise for their skill and dedication, especially the last three difficult months of tender loving care. I thank them from the bottom of my heart. [S4827] Copy of the death certificate of Frederick Ernest Pask, who died 6 July 2014. Kindly provided by Janet Thornill née Pask. [S3] GRO Indexes to Marriages. "1942/Q1 PASK, Frederick E. = HUDDLESTONE, Elsie Newport 11a 534." [S3] GRO Indexes to Marriages. "1966/Q1 PASK, Frederick E. = SMITH, Doris Nottingham 3c 1027." [S4] GRO Indexes to Deaths. "PASK, Doris 20 Nov 1919 Teignbridge 1999 April District 4131A Reg 13DA Ent 149." [S4852] E-mail from Celia Dodd (Guild of One-Name Studies) to Stuart & Teresa Pask dated 16 July 2014: East Anglian Times. [S88] Information supplied by Janet Thornhill née Pask. [S1462] Image of the 1891 Census for Spittlegate, Grantham, Lincolnshire: RG12 Piece 2585 Folio 58 Page 7-8. [S74] Personal Information supplied by Stuart Pask. "Information supplied by Dignity Caring Funeral Services." [S2837] E-mail from Joyce Barnes to Peter Reich of the Grantham Branch of the Lincolnshire Family History Society (LHFS), 15 October 2007 "BURIALS AT GRANTHAM CEMETERY: PASK Frances Alice Grantham 19190303 32 5P5." [S4859] Copy of the birth certificate of George Pask, born 5 November 1856. [S2] GRO Indexes to Births. "GRO Online Index: 1854/Q4 PASK, George PYKETT Grantham 7a 384." [S2035] Image of the 1861 Census for Great Gonerby, Lincolnshire: RG9 Piece 2353 Folio 57 Page 15. [S61] Baptisms, Marriages & Burials Transcript, Great Gonerby, Lincolnshire. [S5547] Image of the 1871 Census : RG10 Piece 3362 Folio 58 Page 18. [S4853] Copy of the marriage certificate of George Pask and Elizabeth Clark, 16 July 1883. [S3] GRO Indexes to Marriages. "1883/Q3 PASK, George = CLARK, Elizabeth Prestwich 8d 580." [S62] Index of monumental inscriptions in the Parish of Great Gonerby, Lincolnshire,. [S4] GRO Indexes to Deaths. "1888/Q4 PASK, George Chapel le F. 7b 417 age 33." [S62] Index of monumental inscriptions in the Parish of Great Gonerby, Lincolnshire, "Buried with his wife." [S2837] E-mail from Joyce Barnes to Peter Reich of the Grantham Branch of the Lincolnshire Family History Society (LHFS), 15 October 2007 "BURIALS AT GREAT GONERBY (Asterisks against names denote headstone): *George Pask d.14 October 1888 age 33 and Elizabeth, wife, d. 8 June 1928 age 74. (George's abode, Buxton, Derbyshire)." Research Note: An Elizabeth CLARK was located in the 1871 census the servant of Bridget MOULDS. This may well be a relation of Sarah PASK née MOULDS, whose grandson George PASK married Elizabeth CLARK. [S153] 1861 Census for Pickworth, Lincolnshire. Full details upon request: PRO Ref RG9 Piece 2347 Folio 5 Page 4. Age given as 6 years. [S62] Index of monumental inscriptions in the Parish of Great Gonerby, Lincolnshire, "Buried with her husband." [S4] GRO Indexes to Deaths. "1928/Q2 LONGLAND, Elizabeth Leicester 7a 305 aged 74." [S5667] Website The British Newspaper Archive (http://www.britishnewspaperarchive.co.uk: ) Saturday 16 June 1938, Grantham Journal, Lincolnshire, England. 1 September 1888 was a traumatic day for William SAVAGE. In the morning he buried his daughter Jane. In the afternoon he returned to work assisting others in loading a ship, the Brig "Anna" lying at No.1 Coal Drop, Royal Dock, Grimsby.They were about to leave when two fellow workers were hauling an iron sheet up a ladder. When it was about 15 ft up from the vessel's deck, the lashing broke and in falling, the iron caught the lower part of SAVAGE's left leg, cutting it badly. He was at once conveyed to the hospital, where it was found that the ankle was badly fractured. Shortly afterwards the lower part (just below the knee) of his left leg had to be amputated. This ended his normal working life and became a Nightwatchman. A Grimsby newspaper reporting on the incident, gave his age as 54, married and residing in Watt's-buildings, Cleethorpe Road, Grimsby. Research Note: For more information see William Savage in my maternal family. [S119] Parish Registers Transcript, Holbeach, Lincolnshire "Baptism: William s William & Frances SAVAGE Labourer of Holbeach Bank." [S142] 1881 Census for Great Grimsby, Lincolnshire. Full details upon request: FHL Film 1341779 PRO Ref RG11 Piece 3268 Folio 8 Page 10. His age was given as 38. [S2] GRO Indexes to Births. "1839/Q2 Holbeach 14 392." [S312] Transcript of the 1901 . "PRO Ref RG13 Piece 3092 Folio 21 Page 34. Age is given as 30 in Index, and 64 in image." [S351] Copy of the birth certificate of William Savage, born 26 May 1839. [S1670] Image of the 1841 Census for Holbeach, Lincolnshire: HO107 Piece 608 Book 3 Folio 33-34 from Archive CD Books. [S1666] Image of the 1851 for Holbeach Bank, Holbeach, Lincolnshire: HO107 Piece 2097 Folio 512 Page 15. [S6] Teresa & Stuart Pask's Guesses, Theories and Speculations: No record yet found. [S4] GRO Indexes to Deaths. "1923/Q1 SAVAGE, William Grimsby 7a 723 aged 82." [S2] GRO Indexes to Births. "GRO Online Index: 1873/Q1 SAVAGE, James William PECK Sheffield 9c 423." [S2] GRO Indexes to Births. "GRO Online Index: 1875/Q2 SAVAGE, Mary Jane PECK Sheffield 9c 400." Fanny Ann PECK was born on 13 June 1848 in 3.30 pm, Halton Holegate, Lincolnshire.2,3,4 She was the daughter of Abraham PECK and Jane Hutchinson BOGG. Fanny Ann PECK was baptised on 16 July 1848 in Halton Holegate, Lincolnshire. Research Note: For more information see Fanny Ann Peck in my maternal family. [S142] 1881 Census for Great Grimsby, Lincolnshire. Full details upon request: FHL Film 1341779 PRO Ref RG11 Piece 3268 Folio 8 Page 10. Her age was given as 31 born in Spilsby. [S2] GRO Indexes to Births. "1848/Q2 Spilsby 14 617." [S27] Website National Burial Index (NBI) @ FindMyPast (www.findmypast.co.uk: ) Birth date given as 1824. [S2234] Image of the 1841 Census for South Witham, Lincolnshire: HO107 Piece 0624 Book 13 Folio 8-9. [S3] GRO Indexes to Marriages. "1850/Q4 PASK, Joseph = PYKETT, Charlotte Newark 15 1105." [S1465] Image of the 1851 for Great Gonerby, Lincolnshire: HO107 Piece 2103 Folio 43 Page 13. [S4] GRO Indexes to Deaths. "1863/Q4 PASK, Joseph Grantham 7a 299." [S27] Website National Burial Index (NBI) @ FindMyPast (www.findmypast.co.uk: ) 16 Dec 1863 Joseph PASK 39 Lincolnshire Great Gonerby, St Sebastian. [S61] Baptisms, Marriages & Burials Transcript, Great Gonerby, Lincolnshire "Burial: Joseph PASK age 39 years." [S2837] E-mail from Joyce Barnes to Peter Reich of the Grantham Branch of the Lincolnshire Family History Society (LHFS), 15 October 2007 "BURIALS AT GREAT GONERBY: Joseph Pask bur. 16 December 1863 age 39." [S2] GRO Indexes to Births. "GRO Online Index: 1852/Q4 PASK, Thomas PYKETT Grantham 7a 393." [S2] GRO Indexes to Births. "GRO Online Index: 1856/Q4 PASK, Betsy PIKETT Grantham 7a 410." [S2] GRO Indexes to Births. "GRO Online Index: 1859/Q1 PASS, Mary PYKETT Grantham 7a 427." [S2] GRO Indexes to Births. "GRO Online Index: 1861/Q2 PASK, Sarah Ann PIKETT Grantham 7a 428." [S2] GRO Indexes to Births. "GRO Online Index: 1863/Q2 PASK, Charlotte PYKETT Grantham 7a 451." [S146] 1881 Census for Great Gonerby, Lincolnshire. Full details upon request: FHL Film 1341771 PRO Ref RG11 Piece 3234 Folio 65 Page 19. [S95] Baptisms Transcript, Foston, Lincolnshire "Charlotte d Benjamin & Elizabeth PYKETT of Foston, Shoemaker." [S2233] Image of the 1841 Census for Marston, Lincolnshire: HO107 Piece 0620 Book 20 Folio 6-7. [S3] GRO Indexes to Marriages. "1881/Q2 PASK, Betsey = PULFREY, George Grantham 7a 839." [S61] Baptisms, Marriages & Burials Transcript, Great Gonerby, Lincolnshire "Marriage: 18 April 1881 Robert PULFREY (Cattledealer of Gonerby, father William PULFREY Cattledealer) and Betsy PASK (age 24, father Joseph PASK)." [S713] Image of the 1891 Census for Great Gonerby, Lincolnshire: RG12 Piece 2586 Folio 88 Page 13. [S4] GRO Indexes to Deaths. "1898/Q1 PASK, Charlotte Grantham 7a 328 age 72." [S27] Website National Burial Index (NBI) @ FindMyPast (www.findmypast.co.uk: ) 16 Feb 1898 Charlotte PASK 72 Lincolnshire Great Gonerby, St Sebastian. [S2837] E-mail from Joyce Barnes to Peter Reich of the Grantham Branch of the Lincolnshire Family History Society (LHFS), 15 October 2007 "BURIALS AT GREAT GONERBY: Charlotte Pask bur. 16 February 1898 age 72." William SAVAGE was baptised on 5 April 1807 in Holbeach, Lincolnshire.2 He was the son of John SAVAGE and Ann BROWN. [S119] Parish Registers Transcript, Holbeach, Lincolnshire "Marriage P172 No 514: William SAVAGE botp Holbeach (X) and Francis JACKLIN sotp Holbeach (X) by banns. Witness: Ann (X) MORRIS; George BRIGHTON; John KITCHEN." [S119] Parish Registers Transcript, Holbeach, Lincolnshire "Baptism: William s John & Ann SAVAGE." [S119] Parish Registers Transcript, Holbeach, Lincolnshire "Baptism: Elizabeth Boulding d Thomas Edward & Elizabeth SAVAGE Farmer of Holbeach Marsh." [S118] 1861 Census for Holbeach, Lincolnshire. Full details upon request: PRO Ref RG9 Piece 2329 Folio 77 Page 18. [S119] Parish Registers Transcript, Holbeach, Lincolnshire "Baptism: Edward s William & Frances SAVAGE Labourer of Holbeach Bank." [S119] Parish Registers Transcript, Holbeach, Lincolnshire "Baptism: Ann d William & Frances SAVAGE Labourer of Holbeach Bank." [S119] Parish Registers Transcript, Holbeach, Lincolnshire "Baptism: Mary Ann d William & Sarah SAVAGE Labourer of Holbeach Bank." [S119] Parish Registers Transcript, Holbeach, Lincolnshire "Baptism: John s & Elizabeth d William & Frances SAVAGE Labourer of Holbeach Bank (twins) born 2 Jun 1837." [S118] 1861 Census for Holbeach, Lincolnshire. Full details upon request. [S119] Parish Registers Transcript, Holbeach, Lincolnshire "Baptism: Sarah d William & Frances SAVAGE Labourer of Holbeach Bank." Research Note: For more information see Frances Jacklin in my maternal family. [S119] Parish Registers Transcript, Holbeach, Lincolnshire "Baptism: James s William & Frances SAVAGE Labourer of Holbeach Bank." [S5508] Website FindmyPast: Lincolnshire Parish Registers 1538-1911: Mark s of John, Elizabeth CLARK, labourer of Pickworth. [S153] 1861 Census for Pickworth, Lincolnshire. Full details upon request: PRO Ref RG9 Piece 2347 Folio 5 Page 4. Gives age as 34. [S304] Grave of Mary Ann and Mark CLARK at Pickworth, Lincolnshire "In loving memory of Mary Ann, wife of Mark Clark, who died 12 October 1892 aged 65 years. What I say unto you for ye know not what day, the son of man cometh. Also Mark Clark who died September 1896 aged 71 years." [S4] GRO Indexes to Deaths. "GRO Online Index: 1896/Q3 CLARK, Mark Grantham 7a 275 aged 71." [S5] Website Miscellaneous Website Gen-lincs-1841 (http://www.srichards.freeserve.co.uk/gen-lincs-1841.htm) PRO Ref HO 107 Piece 611/11 Folio 11. [S296] E-mail from Don Shields to Stuart & Teresa Pask dated 5 February 2004. [S304] Grave of Mary Ann and Mark CLARK at Pickworth, Lincolnshire "
In loving memory of Mary Ann, wife of Mark Clark, who died 12 October 1892 aged 65 years. [S4] GRO Indexes to Deaths. "GRO Online Index: 1896/Q3 CLARK, Mary Ann Grantham 7a 267 aged 65." Research Note: For more information see Abraham Peck in my maternal family. [S145] 1881 Census for Sibsey, Lincolnshire. Full details upon request: FHL Film 1341767 PRO Ref RG11 Piece 3216 Folio 12 Page 18. [S1292] Copy of the marriage certificate of James Peck and Hannah Ackrill, 18 May 1875. [S1291] Copy of the birth certificate of James Peck, born 23 June 1851. [S120] Baptisms, Marriages & Burials Transcript, Spilsby, Lincolnshire. Jane Hutchinson BOGG was born on 16 May 1820 in Spilsby, Lincolnshire.2,3 She was the daughter of William BOGG and Jane HUTCHINSON. Research Note: For more information see Jane Hutchinson Bogg in my maternal family. [S2] GRO Indexes to Births. "Alias Mary Jane." Thomas PASK was born on 10 February 1795 in Great Gonerby, Lincolnshire.1,2,3 He was the son of John PASK and Alice WOODCOCK. [S125] E-mail from Eileen Flinn to Stuart & Teresa Pask dated 26 April 2004. [S1458] Image of the 1841 Census for Great Gonerby, Lincolnshire: HO107 Piece 618 Book 15 Folio 6-7 from Archive CD Books. [S1464] Image of the 1851 for Great Gonerby, Lincolnshire: HO107 Piece 2103 Folio 42 Page 10. [S4] GRO Indexes to Deaths. "1852/Q3 PASK, Thomas Grantham 7a 279." [S61] Baptisms, Marriages & Burials Transcript, Great Gonerby, Lincolnshire "Thomas Pask of Great Gonerby age 57." [S2837] E-mail from Joyce Barnes to Peter Reich of the Grantham Branch of the Lincolnshire Family History Society (LHFS), 15 October 2007 "BURIALS AT GREAT GONERBY: Thomas Pask bur. 8 July 1852 age 57." [S61] Baptisms, Marriages & Burials Transcript, Great Gonerby, Lincolnshire "Full age at marriage." [S125] E-mail from Eileen Flinn to Stuart & Teresa Pask dated 13 January 2006. 15 July 1801 Joseph and Sarah, son and daughter of William and Ann Moulds. [S4642] Image of the 1871 Census for High Street Sheep House Lane, Great Gonerby, Lincolnshire: RG10 Piece 3363 Folio 17 Page 28. [S4] GRO Indexes to Deaths. "1871/Q2 PASK, Sarah Grantham 7a 281 age 70." [S61] Baptisms, Marriages & Burials Transcript, Great Gonerby, Lincolnshire "Burial: Sarah PASK of Great Gonerby, age 70." [S2837] E-mail from Joyce Barnes to Peter Reich of the Grantham Branch of the Lincolnshire Family History Society (LHFS), 15 October 2007 "BURIALS AT GREAT GONERBY: Sarah Pask bur. age 70 ......."
Benjamin PYKETT was baptised on 27 November 1778 in Marston, Lincolnshire. He was the son of Robert PYKETT and Ann LOUGHTON. Benjamin married Elizabeth DOUGHTY, daughter of John DOUGHTY, on 6 March 1812 in Foston, Lincolnshire. Benjamin died on 6 March 1830 in Foston, Lincolnshire, at age 51. Elizabeth died on 8 March 1863 in Marston, Lincolnshire. [S1665] Image of the 1851 for Marston, Lincolnshire: HO107 Piece 2138 Folio 199 Page 7. Indexed incorrectly under the name of TYKETT. [S56] 1861 Census for Marston, Lincolnshire. Full details upon request: Folio 116. [S1671] Image of the 1891 Census for Marston, Lincolnshire: HO107 Piece 620 Book 20 Folio 8-9 from Archive CD Books. [S56] 1861 Census for Marston, Lincolnshire. Full details upon request. John SAVAGE was baptised on 20 November 1771 in Holbeach, Lincolnshire.1,2 He was the son of John SAVAGE and Dinah WILLMORE. Research Note: For more information see John Savage in my maternal family. [S119] Parish Registers Transcript, Holbeach, Lincolnshire "Baptism: John s John & Dinah SAVAGE." [S119] Parish Registers Transcript, Holbeach, Lincolnshire "Burial: John SAVAGE age 40 years." [S119] Parish Registers Transcript, Holbeach, Lincolnshire "John SAVAGE botp = Ann BROWN sotp Banns. Witnesses Rd ENGLISH; Mattw PARTRIDGE & John BAXTER." [S119] Parish Registers Transcript, Holbeach, Lincolnshire "Baptism: John s John & Ann SAVAGE." [S119] Parish Registers Transcript, Holbeach, Lincolnshire "Baptism: Mary d John & Ann SAVAGE." [S119] Parish Registers Transcript, Holbeach, Lincolnshire "Marriage P16 No 46: John ROBSON of Parish Holbeach and Ann SAVAGE (widow) in presence of John KITCHEN; Elizabeth GEORGE; and Joseph GEORGE." [S121] E-mail from Denise Grant to Stuart & Teresa Pask dated 21 September 2003. [S287] Parish Registers Transcript, Holbeach, Lincolnshire "Burial: John ROBSON aged 39 of Holbeach Bank." Research Note: For more information see George Jacklin in my maternal family.